A while back, LittleFruits Feltery blew us away with their amazingly creative, adorable and fun play felt tree. We never thought we’d see something as cute again, and yet… Now LittleFruits Feltery has added some tropical delight to their shop – the bright and colorful Banana Felt Tree. This cuter than cute tree will have your child playing treasure island in no time flat. 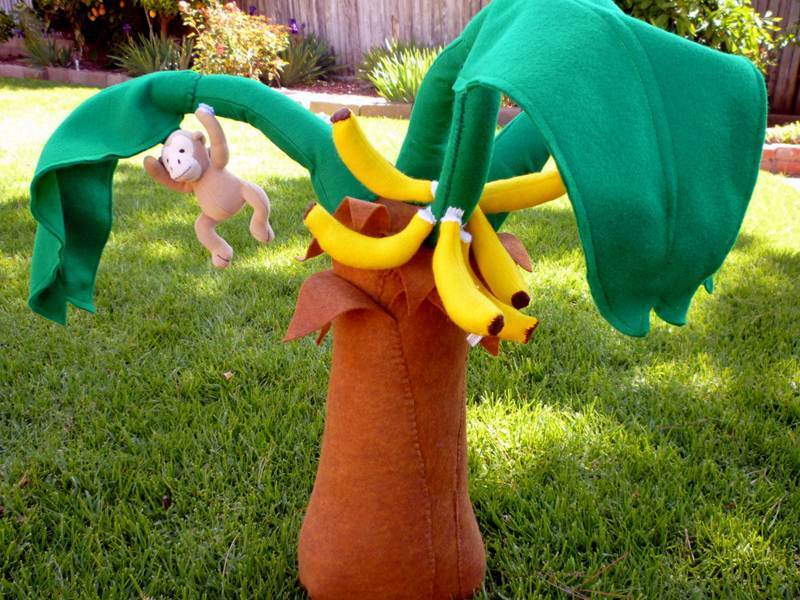 A creative Velcro design allows kids to pick bananas right off the tree and then put them back on. Branches are bendable and the tree is made by hand with 100% eco-fi felt. Sorry folks, that mischievous little monkey doesn’t come with the tree, but we do love the idea! We can’t wait to see what LittleFruits Feltery comes up with next. A while back, LittleFruits Feltery blew us away with their amazingly creative, adorable and fun play felt tree. We never thought we'd see something as cute again, and yet... Now LittleFruits Feltery has added some tropical delight to their shop - the bright and colorful Banana Felt Tree. This cuter than cute tree will have your child playing treasure island in no time flat. A creative Velcro design allows kids to pick bananas right off the tree and then put them back on. Branches are bendable and the tree is made by hand with 100% eco-fi felt. Sorry folks, that mischievous little monkey doesn't come with the tree, but we do love the idea! We can't wait to see what LittleFruits Feltery comes up with next.